So, is it just me or is anyone else totally stoked about the recent trend in modest dresses? (i.e. 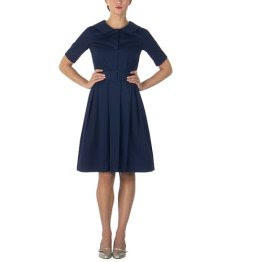 sleeved-to-the-knee-no-camisole-or-cardigan-necessary-perfect-for-us-Mormon-girls-dresses). 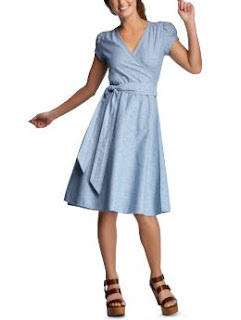 I have really been into dresses lately -- and I finally realized it's because there are so many available that I can actually choose from right now and not have to worry buying the extra $20-$40 coverups that I usually need to go with said dress. I've always been a skirt-and-top girl for this reason alone, but right now I'm ready to buy up every modest dress I see, because I'm so worried I'm gonna miss the trend and be completely out of luck. Dress shopping has always been easy for me because I can pretty much narrow down the ones that I can actually wear in no time -- and then the pickins' aren't that great when you come down to it. Last summer we had 4 different formal occasions to attend with all of the same crowd of people, so I was in desperate need of dresses. I ended up buying all sleeveless and strapless dresses and adding shrugs... totally annoying! But now, it seems like I could find something so easily. you can't really tell from the pic... but this one looks really cute on. that's right, I had to at least try them all on. I was really excited when Noah decided he was done with his pacifier and took to the little bear that I had so strategically placed in his crib from day 1. But then the bear quickly took on the role of pacifer too. His little nose gets used and abused every night by my relentless child to the point where we've had to replace said bear twice now. Luckily, I remembered that nana Cathy had originally supplied Noah with his first bear at my baby shower and she has been able to replace him. sorry, #3... you're totally in for it! I think he actually looks scared. Wow... I was just looking through my pictures from the weekend to post and it seems like we REALLY went all out for Easter this year! 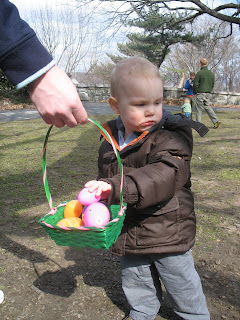 Noah had 5 Easter egg hunts... including his little treasure hunt that we did on Sunday morning to find his basket -- a HUGE hit! 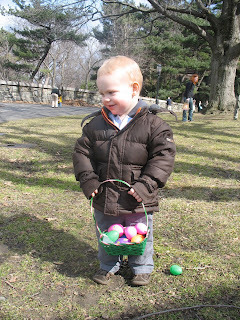 He's definitely an Easter-egg-hunting-pro now and is actually starting to expect "jewy beens" and "eastuw eggs" every day. 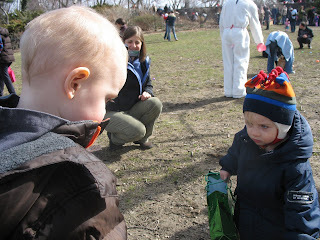 On Wednesday, we had a little Easter party with our playgroup where we colored eggs and dressed up in bunny ears and then we headed up to gma and gpa's house for the weekend. 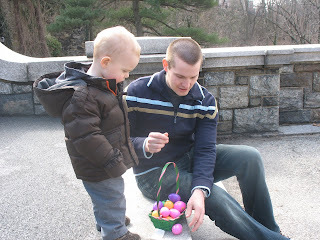 We went to yet another egg hunt at my mom's church and had a great time hanging out in the 'burbs. Noah is in LOVE with gpa's car ("hee-haw's caah") and would wait by the door every morning until we went out. It's amazing how much he's talking now and how hard it is to understand him at times, but we're loving the attempted communication and will take it over a tantrum anyday (not to say that those are over by any means, but they are definitely fewer and farther between!). 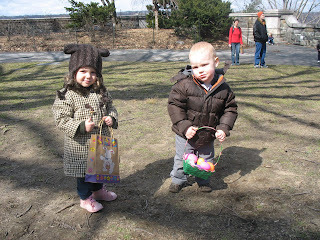 We headed up to the annual Easter Egg Hunt in Fort Tryon Park today. It was a fabulous little neighborhood event. 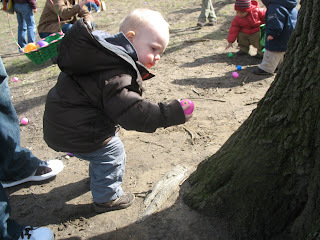 There were lots of eggs found, treats consumed, and some good old community fun had. 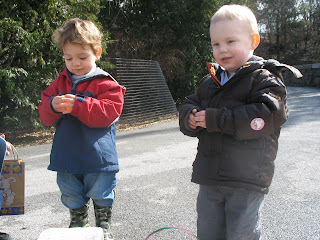 The weather held up rather nicely (considering the forecast...) and we met up with some of our neighborhood pals. I admit it... I love Bravo reality TV shows. There it is, out in the open. In fact I watched the first episode of Top Chef twice in a row on Wednesday night when it premiered... (mostly because Jon was on call and I have a hard time falling asleep in my bed without him -- and I kept dozing off the first time it came on... but that's beside the point!) 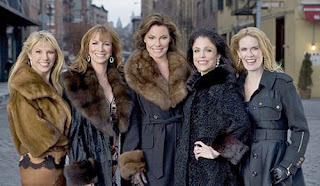 Anyway, when I heard they were doing a reality TV show called, "The Real Housewives of New York City," sort of patterned after the version in Orange County, I was definitely intrigued. This week was it's second week running, and I'll be honest, I really can't stand it. I've actually felt a lot dumber after watching it. I gave it a fair chance after the first week and thought I might get into it a bit more. But, the characters are SO lame! And I feel like it gives the people that live here such a bad rap. Granted, there are a lot of socialite types here that run the city and everyone's obsessed with money and image... but I seriously can't get over how uninteresting these people are. Their life consists of who they are going to try to impress next and instead of making me want a house out on the Hamptons or to shop on 5th Avenue, I actually started appreciating my little ghetto neighborhood a bit more. I came across this review in the L.A. times and couldn't agree more. And so as I sat in my 800 sq. 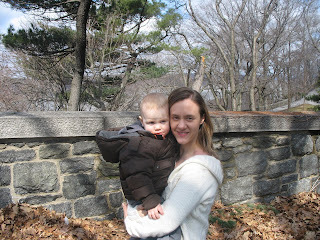 ft. apartment with 3 other stay-at-home-moms and their toddler boys, listening to Jack Johnson and munching on the oatmeal raisin cookies I had made for the occasion, I couldn't help but think that we were "The REAL Housesives of New York City." Here's a glimpse of next week's episode... looks like I won't be missing much. So, Noah's latest "skill" that we've been working on is learning the days of the week. He's currently obsessed with Eric Carle's book "Today is Monday". There's a little song that goes along with the book that can instantly calm Noah down if he's in meltdown mode -- gotta love those! (I think it was originally a song and then Eric Carle added some illustrations.) 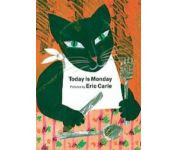 Anyway, it's a cute book because it lists the days of the week and then some kind of food to go along with each day. It goes, " Monday, string beans, Tuesday, spaghetti, Wednesday, ZOOOP!, etc." After the millionth time of reading this book to Noah I started thinking about our weekly dinner menu planning and realized that we're in a food rut and definitely need some help. I actually don't mind having the same dinner menu on a weekly basis... I get used to the recipes, I know Noah will eat what I make, and since we do online grocery shopping, it's a cinch to order groceries week after week (click, click and done!). However, I have to start changing it up every so often or it just becomes WAY too monotonous. So, it's time for a new weekly dinner menu plan and I want some ideas! Please post your favorite family-friendly, budget-friendly, time-friendly, diet-friendly meals so I can get some ideas and I don't have to make up my own song.... "Monday, stir-fry, Tuesday, chili, Wednesday, fajitas..." etc.